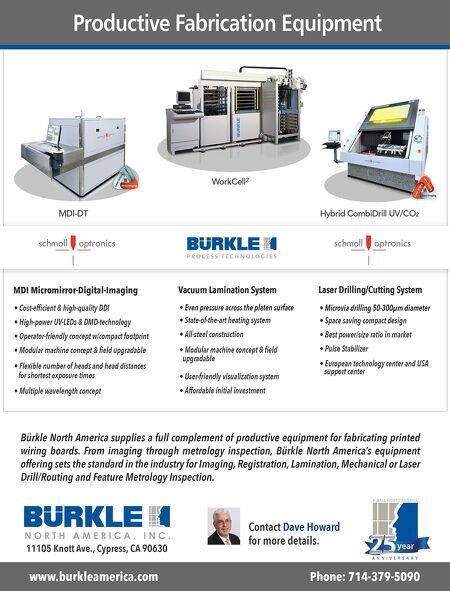 72 The PCB Magazine • December 2017 Introduction Any major initiative, whether implement- ing ISO, lean manufacturing or introducing a new product, requires culture change. How this change is managed will be the difference be- tween success or failure of the project. This col- umn will offer some fundamental elements that will help navigate your next major implementa- tion by shifting the culture. Sage Advice I was enjoying a fine cigar and cognac with an old friend a number of years ago when the dis- cussion turned to the challenges of initiating a major change like imple- menting ISO. I asked my friend, whose opinion I greatly respect, "How do I begin to steer a com- pany in a new direction that is so transforma- tional it is sure to meet a heavy dose of resis- tance, skepticism and at- titude?" My friend said, "You have to change the culture; and that is no small task." He went on to say, "Steve, have you heard the definition of insanity? Insanity is do- ing the same thing over and over again and ex- pecting different results." As he has a talent for, my good friend had distilled a very complex issue down to a single, critical point: culture shift. As the evening wound down and we began to go our separate ways, I said, "Good talk Al, by the way, how's your theory of relativity thingy go- ing?" Culture Shock Why is organizational change needed? Be- cause in America, people tend to accept that a certain amount of error is normal. You expect the plane to be late. You expect some mail to get lost. You expect consumer electronics to break down right after the warranty runs out. This translates to our manufacturing opera- tions as well; we expect a certain amount of our process output to be de- fective, and we plan for it. This mindset extends further into our quali- ty systems, where many times the focus is on de- tection and not preven- tion. Quantum opera- tional improvement re- quires a cultural shift that not just expects, but demands, exceptional quality to be the norm, with perfection as the goal. As the great Vince Lombardi once said, "Perfection is not attain- able, but if we chase per- fection we can catch ex- cellence." Fundamentally, most quality systems all want the same thing: a docu- mented process that focuses on continuous im- provement. 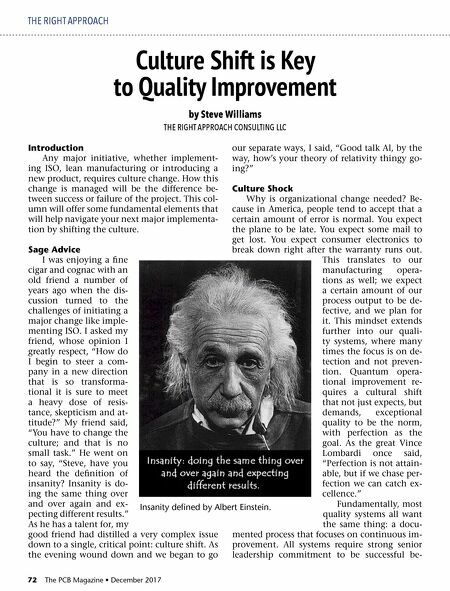 All systems require strong senior leadership commitment to be successful be- Culture Shift is Key to Quality Improvement THE RIGHT APPROACH by Steve Williams THE RIGHT APPROACH CONSULTING LLC Insanity defined by Albert Einstein.